Explorations in Quilting and Life: Did you know? Did you know that there was a city built underground in Turkey during the 8-7th centuries B.C. that could accommodate between 35,000 and 50,000 people. The city, named Derinkuyu, had a total of 11 floors, each of which could be closed off separately. The city had many amenities, such as wine and oil presses, stables, cellars, storage rooms, refectories, and chapels, that were also found in other underground complexes of the day in the area. I found that absolutely fascinating! The city is located in the region of Cappadocia in Turkey - a region characterized by soft volcanic rock which made construction underground relatively easy. The rock was soft to dig through but hardened upon exposure to air. I learned all this while out for a long run on Sunday. I always listen to podcasts of travel guru, http://www.ricksteves.com/. An hour passes in no time as I visualize the places that Rick and his guests describe. Rick's podcast from October 8 includes an interview with Lale Surnam Aran, tour guide/organizer based in Istanbul, Turkey. Back to Derinkuyu, can you imagine 50,000 people living underground? Even today, it sounds like a futuristic concept. And, this was already accomplished over 2500 years ago. 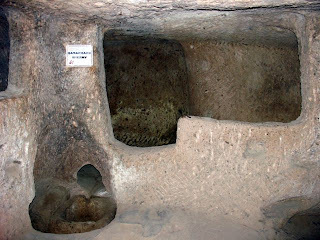 Nevşehir Province has several other historical underground cities. The cities and structures are carved out of unique geological formations. They were used by Christians as hiding places during times of persecution and raids. The locations are now archaeological tourist attractions. They remain generally unoccupied. In excess of 200 underground cities containing a minimum of two levels have been discovered in the area between Kayseri and Nevsehir. Some 40 of those contain a minimum of three levels or more. The troglodyte cities at Kaymaklı and Derinkuyu are two of the best examples of habitable underground structures. Hmmm...what happens in an earthquake?